A few things must be said prior to launching into the first trip report for 2016. First, a giant thank you to Mr. Robert Dowd. 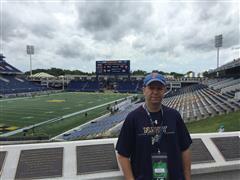 Bob is on a journey to see a college football game in the 49 of 50 states where college football is played. Guess which state does not, and it is the obvious one. He is very close to completing his journey! He has been following our exploits for a few years now and we have been following his. Bob sent us a pair of tickets to this game completely unsolicited. 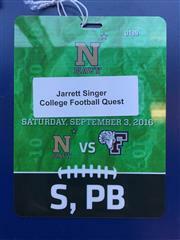 When finding out that we were headed to Navy, he came through with a pair of tickets as Bob is a follower of the Midshipmen. Thanks Bob. Secondly, would be amiss if we didn’t thank Scott for everything he did to enhance our game day experience while at Navy. 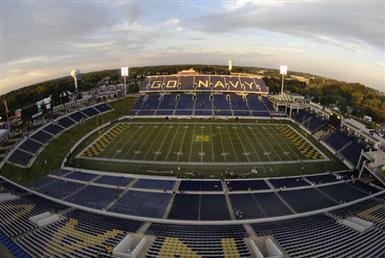 We had a great two days at The Yard cumulating with a great win by the Navy Football team! Third, a giant boo to Al, who did not have his new used Porsche certified to make the 250 mile trek to Annapolis. If you are going to buy a car that evokes memories of Ferris stating “It is so choice. If you have the means, I highly recommend picking one up.…”, then wouldn’t you want it on the open road of the I-95 Northeast corridor at 4am. Al would like to add that being the car is not brand new and has only been in his possession for a week, the risk versus reward of Jarrett’s brand new (3 year old really) Audi Autobahn special, wasn’t worth it. However, he is happy to take me on a trip out east to play golf (rental clubs only because golf clubs don’t fit in the car) before it gets cold, and I can wear my Blackhawks jersey. And finally, this tropical storm / hurricane watch thing that we do is getting old. This time it was Hermine, potentially creating havoc with our plans. But happily, it was much ado about nothing this time, but again, this is getting old. Al has refused to ever comment on anything hurricane related, except to say he doesn’t want to comment. See previous trip reports for “history of hurricanes on the quest”. You can start with Wake Forest. You know how this section usually starts so I will cut to the chase… I picked Al up at 4:00am for the 4 hour or so drive to Annapolis, Maryland, home of the United States Naval Academy. Why so early, you ask? Well, I will tell you what our thinking was. The USNA website said that there was a 10am tour of the USNA and we wanted to see the Naval Museum (which opened at 9am) prior to the tour, with the website indicating it would take 2 hours to see the museum. We actually do research on this stuff. Of course when the website is inaccurate or out of date, that does not do well with our planning. Anyway, we intended to get to the museum at 9am when it opened. Thus a 4am departure. A special thank you to Frank DiVenti, CMO of the VAAAC for providing tons of things to do at the Yard, and making this easier for our planning sessions. We arrived in Annapolis, parked the car downtown, and walked over to the USNA, after the nice security guard told us no parking at USNA unless you have a DoD id. We did not. We entered the USNA via the pedestrian entrance (after walking and dry heaving past a Jimmy Johns) and proceeded to the welcome center where we were informed that the first tour would actually be at 9:30. Se we had our first decision moment…wait 30 minutes for the tour OR walk to the Naval Museum. We opted to go to the museum, not realizing we would take the 30 minutes walking there. Not quite, but it makes for more dramatic irony if I say that. Interestingly, once you pass the entrance to the USNA, you are able to walk the grounds quite freely. As an aside, the USNA is a well signed campus. I would expect nothing less but have been surprised by much less before. The Naval Museum does not open with military precision, it must be subcontracted out. It took far less than the 2 hours recommended to visit the museum and we were then back in the visitors center awaiting the 10am USNA tour. The USNA is called the Yard. I am sure someone will set the record straight but is there a commonality between the USNA being called the Yard and that’s what the outdoor rec center in a prison is called as well? Hmmm. Al believes the Yard is called that because it used to be a ShipYard, and now is landfill. There were many nice cars being driven around the Yard. Either the DoD pays well or there are a lot of civilian contractors/instructors that get paid well. After touring the Yard, it was into Annapolis for some lunch. Annapolis has a very charming area by the water which is where we chose to eat, Federal House Bar & Grill. I am still somewhat in diet mode, so I had a seafood salad which was quite good. Much better than expected from the outward appearances of the place. After lunch we headed to the Maryland State House as Annapolis is the State Capital of Maryland, for those who slept through Geography. As regular readers of our trip reports know, we are quite fond of state capitals and have been to quite a few. I can honestly say that thus far, Maryland has the most underwhelming (this is me being kind and not flat out calling it the worst) State House yet. It consists of four rooms; old senate, old house, new senate, and wait for it…new house. There is no tour, which when there are only four rooms makes sense. I was curious if this was one of those, they are only in session for one week every two years gigs. Point of fact, they are in session for 90 days annually. Still, a very comfy gig indeed. Yet the surrounding area comprises 50 law firms. The business of Maryland is on autopilot. Next on the agenda, Annapolis trolley tour. By this time we had gotten the feeling that we had seen most of what Annapolis had to offer. I could describe Annapolis like this; it is 50% art galleries, 50% tourist trap souvenir shops, 50% bars/restaurants, and 50% places to get dessert. So not knowing if a trolley tour was worthwhile, we headed to the visitors bureau. In the nicest, sweetest way possible, the 75 year old women working at the bureau told us essentially, Annapolis is a small town, there is not much to see, it seems like you have seen most of it, go have a drink. She really did not say that in those words, but is was clear that based on what we had already done, that was the gist. Needless to say, the trolley tour was nixed. We walked around Annapolis a bit more, and then headed to the hotel for a bit of rest. Remember 4am departure. O’Callaghan’s would be our home for the night after a last minute change from a hotel further away from downtown after a room opened up here. Staying here would allow us to walk back into downtown as opposed to having to drive or cab. We dropped the car off at the valet stand (the only option), and checked in. Many will argue with the next statement, but Al and I are both reasonably intelligent people. I have a certain skill set with electronic gadgets; certainly not the most tech geek person but not a technophobe. Neither one of us was skilled enough to figure out the remote control to the TV. We never did figure out just why the hell the TV remote did not work. This was not a matter of the battery, input, setting, am/pm, the snooze or anything like that. We just could not get the hell out of the guide and menu. I also must point out that the wall plate by the desk had a connection called “dial up”. Do I really need to comment on that at all? Half the people reading this probably have no idea what dial up is, let alone the 30 AOL Online cd’s per month that every human on the planet received. What is a cd? With a 3:15 wake up call, you eventually reach a point where you say, if we do not get out of this room now, I am going to bed for the night. That time came and we headed out for some dinner. We walked back into Annapolis center and scouted out a few places. While looking at the menu of Pussers, we were asked by a passerby if we were local. Upon stating that we were not, we were told not to eat there and there were much better options upon which she listed a few. Unsolicited advice not to eat there is all we needed. Either she had a grudge against the place or was trying to be helpful, either way her dog was very cute (not a euphemism) so we bought in. We ended up at a place called Preserve, mainly because Al does not like sushi and Jarrett likes open kitchens. It is a somewhat eclectic menu but the food was fantastic. I clearly ordered wrong as I was still trying to maintain a semblance of the diet that I am on, but Al had no such reservations. The potato chips and bacon mayo was incredible as was the shrimp toast. Al’s pork and sauerkraut main looked awesome while my griddled chickpea cakes (I told you it was a wrong order) while good, certainly did not compare to everything else that was on the table. And it was not really a table as we sat at the bar in front of the open kitchen. They were good seats and we even learned that Peyton Manning’s “Omaha” call has found its way into a gourmet kitchen. I had to ask and it was their shorthand for an accompaniment to the goat cheese dish. Good to know. As an aside, it took 40+ trips, but Al was finally groped on a college campus. No further comment will be provided. The story can be provided offline to those interested, including you Alexis. As I have a somewhat interest in food and restaurants, a quick google search (royalty please Alex as I could have said a quick Ask Jeeves search) later, turns out that the restaurant is owned by two CIA grads and they have worked in some of the finest kitchens in the country. Sitting where we were, it was easy to tell the kitchen had a very professional nature to it, we just did not realize the extent and that the chef/owner was right in front of us the whole evening. We ended up in the right place. I can not say this is a hidden gem, because I have no idea if it is hidden or not, but definitely the place to go in Annapolis, for me anyway. Next time, no diet considerations. I can not end the dinner conversation without mentioning that another diner at Preserve came over and asked which of the places we have been had the best tailgating. You see, I was wearing the College Football Quest t shirt that I had made over the summer. He saw the shirt and asked the question. We answered, Ole Miss, but the best environment was LSU. The response was, I knew it, we are from LSU and I knew that was going to be the answer. Score one for the new t shirt. Good thing I made a bunch of them so laundry will not be an issue for the Quest season. And thanks to the help from my wonderful and patient wife, they came out quite nice if I do say so myself. After dinner it was across the street for drinks at Acme. Not sure of the history to the name, but if it is anything not related to Wile E Coyote, then boo / hiss. A few drinks, a bit of football, and a few videos later (no more can be said about the video as Al wishes to remain married), it was off to bed. Finally. It is quite frustrating when you want and can sleep late, but just don’t. Game time is noon, so it was not a sleep until lunch day, but I certainly did not need to be up at 6:39am, but that is when I awoke and had no chance of falling back to sleep. Very frustrating! And no Beth, I can not blame this on you, THIS TIME! Breakfast was a quick stop at Dunkin Donuts and then it was onto Navy-Marine Corps Memorial Stadium. We did a quick tour around the stadium and the significant tailgating going on at 10am. Pregame was spent at field level taking in the grandeur that is college football. Watching warmups, it was clear that the smallest guy on Navy was bigger than the biggest guy on Fordham. Not really, but the size difference was stark. We both proceeded to pick Navy. Spoiler alert: We have both started the year with a win. 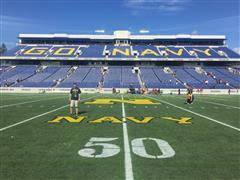 Pregame festivities at Navy were quite a sight. The march on of the Brigade of Midshipmen was very impressive. The entrance video for the football team was well done as well and included music from the movie Top Gun. As an aside, Top Gun is actually a Naval Aviator School which begs me to ask the question, why does the Navy have airplanes? Shouldn’t that be outsourced to the Air Force? Isn’t that more efficient, not that the government cares about efficiency? Al states that the Air Force would then need to train its pilots in Navy stuff (being on board a ship, etc.) so either way one armed forces branch is training in the others specialty. But to me, being a pilot in the armed forces is a much more specialized skill than learning to live on a ship so it seems like air consolidation would make sense and the Navy could outsource its air operations to the Air Force. I must be missing something so if anyone can shed light on this, please let me know. The flyover and parachute jumper were cancelled for today, so we missed out on that and regular readers know we like that stuff. Thank you Hermine. The game kicked off at 12:02 and was over at 12:02:30. Navy kicked off and scored 12 seconds into the game as Fordham fumbled the opening kick and on the first play from scrimmage Tago Smith runs 7 yards for the TD. Fordham actually answered quite nicely running 10 plays and getting to the Navy 29 yard line before failing on a 4th and 3. Seven plays, 71 yards later, we had a 14-0 Navy lead. Again, Fordham answered nicely going 9 plays and kicking a field goal, 14-3. Unfortunately for Fordham, they could just do nothing to stop the Navy offense and 3 plays later it was 21-3. But the Fordham offense answers the bell with a 34 yard TD pass aided by a PI call and we are at 21-10. Navy opens the 2Q with a very costly 84 yard TD drive as Tago Smith goes down for the year with a torn ACL. Will Worth continued the drive and looked impressive, but this could be a blow to the Navy season. 28-10 Navy. At halftime, Malcolm Perry was optioned from the stands having walked with the Brigade of Midshipmen, as the new backup QB. Believed to be the first time a player walked in the Brigade and took a snap in the game. Navy would add one more TD in the 2Q for a 35-10 halftime lead. The final gun would sound with a 52-16 Navy victory. With a nod to how useless the time of possession stat is, Fordham led in TOP and actually led in number of plays 81-57, but this game was dominated by Navy. Rushing yards were 427-162 and Navy threw a total of 4 passes. That was the story of the game. But the Fordham offense can hold their heads up a bit. They did gain 464 yards averaging just under 6 yards per play. They had numerous long passes in which the receivers were open, the ball just failed to be delivered accurately causing the Fordham coaching box to shout in agony. This could have been a wild shootout with just a bit more accuracy from Fordham QB Kevin Anderson. The agony from the coaches was so acute, one would think they receive a bonus when scoring 20 points despite being down by over 30. Annapolis is a very dog friendly town. Dogs are even allowed into Dunkin Donuts. My guess is health regulations are trumped by local ordinance. Annapolis is in desperate need of a mason. Both the USNA and the town of Annapolis are in need of significant brick leveling work. As in someone will get seriously hurt and become quite rich. Job #1. Priority Uno. Etc. Fordham would go on to a successful season ending with an 8-3 record. The Rams would go 5-1 in the Patriot League which was good enough for second place behind undefeated Lehigh. The Midshipmen would start the season 9-2, including wins over #6 Houston and Notre Dame, before dropping their final games to Temple and Army, ultimately finishing the regular season at 9-4. It was a disappointing end to the season, particularly the loss to Army. Navy would lose the Lockheed Martin Armed Forces Bowl to Louisiana Tech 48-45. For our Navy photo album, Please click here. You can view as a collage or run as a slideshow. There are comments to explain what is in the photo but most are self explanatory. Thanks to Google, I can no longer embed the slide show with comments.